Marshall Cavendish Children’s Books, 2008. 53 pages. I delight to think of a beginning reader decoding this book and being rewarded all along the way with hilarious inside jokes. Down Girl and Sit: Bad to the Bone has four chapters, so it is for a child already reading. But the chapters are short, full of pictures, and laugh out loud funny in a way the narrator would never understand -- but the reader does. Down Girl tells us the story of how she and her friend Sit attempt to train their masters with simple concepts. For example: "Cats are bad. Dogs are good." The reader knows that Down Girl is completely misinterpreting her master Rruff's intentions, as Down Girl earnestly explains how she loyally carries them out. Especially delightful and reminiscent of "Who's on First?" 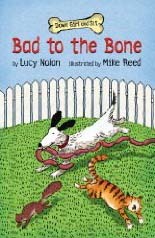 is the chapter after Down Girl and Sit tried to be "bad to the bone" to get attention. Their masters take them, along with another dog Hush, to Obedience School. Their poor masters are not very quick learners! They keep calling Down Girl and Hush by Sit's name! Then they start using the name of some dog named "Stay." This could have gone on forever, but thank goodness a squirrel ran past. We all jumped. We barked and tried to chase him. Our masters yanked on our leashes. Finally! They got our names right. Now they might pass the class. We looked to see if the teacher was smiling. He was not. Well, I can't blame him. We have been working with our masters for a long time. We haven't gotten very far either. I wanted the teacher to cheer up, so I jumped up and kissed him. I wagged. It is very, very hard to train a human. But sometimes, just sometimes, they can surprise you.